Approximate locations of Thursday evening's robbery (star) and other recent hold-ups that are part of a pattern according to Chicago police. Two men mugged a woman and stole her purse Thursday evening in what appears to be part of a growing robbery pattern in the Lincoln Park neighborhood. No one is in custody. Witnesses chased after two offenders who robbed the woman in the 2200 block of North Fremont Street around 8:30 p.m. last night. The Good Samaritans managed to get back some of the woman’s property, but the offenders slipped away with her wallet. The offenders were described as two black males—one wore a dark hoodie and the other wore a surgical mask, police said. They were last seen in the area between Belden and Fullerton on Fremont. Police last week issued a community alert about a group of robbery offenders that had struck repeatedly in Lincoln Park over the past month. The crew described in the community alert is comprised of males in their mid-to-late teens who strike during afternoon and evening hours. 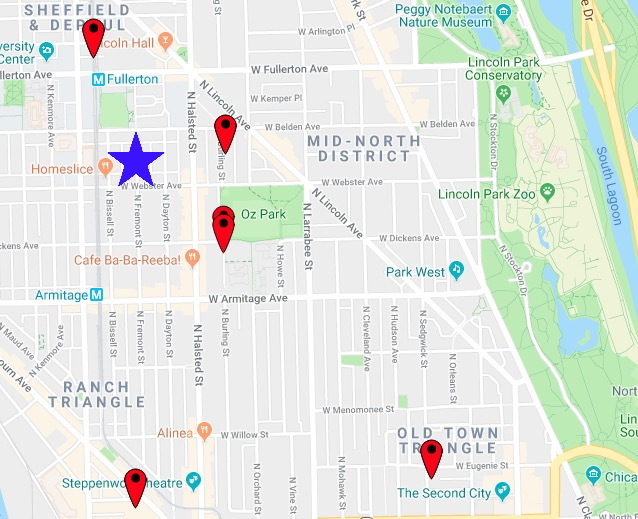 Three of the robberies mentioned in the community alert were reported on North Burling Street near Oz Park and Lincoln Park High School: on Nov. 17th in the 2200 block of North Burling Street, and on Dec. 7th and Dec. 11th in the 2000 block of North Burling Street. Other incidents were reported in the 1600 block of North Clybourn on Nov. 27th; the 300 block of West Concord on Dec. 10th; and the 900 block of West Fullerton on Dec. 12th, police said. In the Dec. 10th case on Fullerton, a woman reported that she was pushed and robbed by a man who then fled through a gateway on Fremont Street. The offender was described as a black male in his 20's who stands 6-feet tall. He was wearing a jacket and acid wash jeans, according to a police report. The community alert offers a general description of the suspects: one to four black males who stand 5’7” to 6’1” tall and weigh 140-180 pounds. Anyone with information about the crimes or the suspects may contact Area Central detectives at (312) 747-8380.